Also see the How to Conduct Academic Research library guide for more information about how to conduct research or take our Research Process tutorial here. 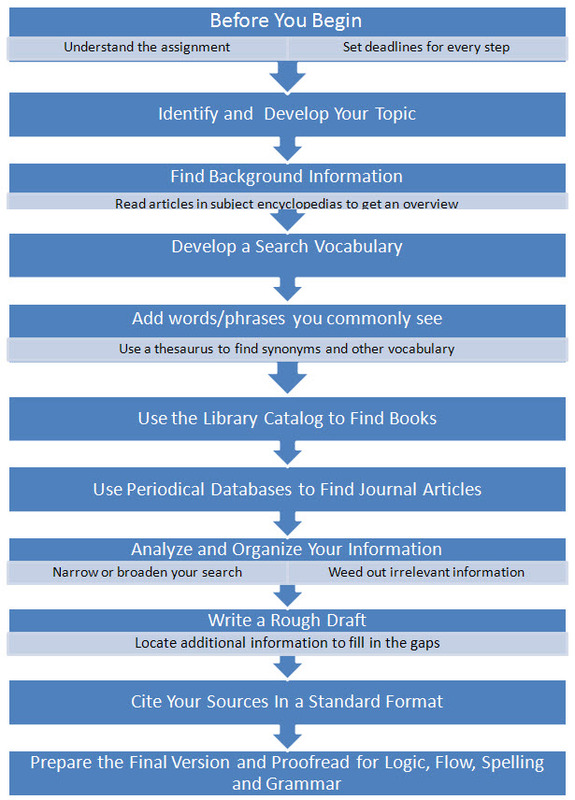 Image: "Online Library Orientation: The Research Process." Hillsborough Community College, 19 Mar. 2018, libguides.hccfl.edu/c.php?g=472755&p=3234350. Accessed 21 Mar. 2018. Research can be a tricky, sometimes confusing process. If you're stuck, lost, or just have a question, please contact us! Start by brainstorming some potential topics to explore further. Look through your syllabus or textbook for themes, concepts, or ideas that interest you, even if you haven't covered them in class yet. Search the topic or name of your course in Google or a library article database. Check out any results that look interesting. Think about your major or your hobbies. Do any of your personal interests overlap with the topic of the class? Now that you have a potential topic in mind, find out a little more about it to make sure it will work for you. Search for background information to get a general overview of the topic. Sometimes what you find is not what you expected. Make sure the topic still sounds interesting, since you'll be spending a lot of time reading and writing about it. Check library article databases, such as Academic OneFile, to see if journalists or scholars have written about your topic in the popular press or academic journals. Finally, you'll need to find the right scope for your topic. If it is too broad or too narrow, you may have difficulty covering it adequately in the length assigned for your research project. Too broad - if you found too many results when testing the topic, you might need to choose a specific aspect to focus on. Try looking back in your background information for particular details that interest you. Too narrow - if you had trouble finding any relevant information in a library database, think more broadly about the topic and what interests you. What are the larger concepts or ideas that your topic falls under? Text: "Choose a Topic." University of Texas Libraries, 21 Dec. 2017, guides.lib.utexas.edu/choosetopic.